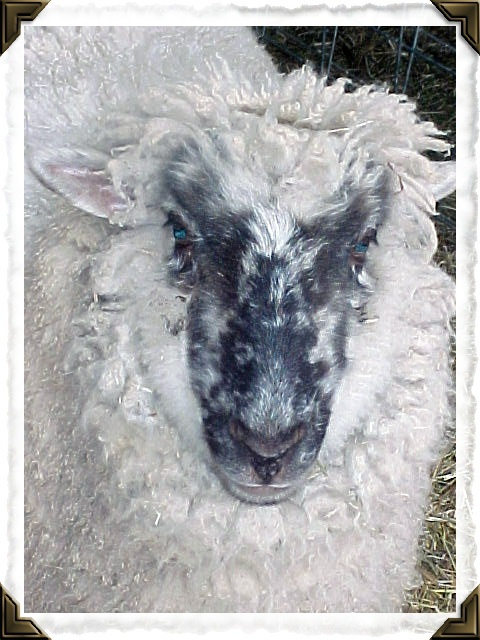 Our Tater was a beautiful Suffolk cross sheep! He was 11 when he left us for heaven a few years ago. He was a sweet boy completely and totally hooked on Fruit Loops! He had a cute nose he loved to have scratched and I think he loved me best! He was one of very few lambs born on our farm. His mom, Ruby, was a Suffolk sheep we retired from our friend Mary's flock. Ruby did not get pregnant for several years so we were lucky to add her to our flock. Next spring? She had twins! Tater and Frannie. I was thrilled beyond words of course- and very scared when it happened! His fleece is beautiful. No bias here right? The other part may have been Corriedale. Both breeds show in the wool, all the best traits of each. The locks average 3 to 4 inches long, features a cute tiny crimp and a bit of bounce when spun into yarn. Easy to wash, felt and any other project you would choose to add this wool to. It is soft and has minor debris remaining to remove.